Choosing the Best Colors for Jewelry Displays for Your Type of Jewelry. Ovadia Corp’s guide to Jewelry Display and Showcasing. | Ovadia Corp Jewelry Display Blog Choosing the Best Colors for Jewelry Displays for Your Type of Jewelry. Ovadia Corp's guide to Jewelry Display and Showcasing. Choosing the Best Colors for Jewelry Displays for Your Type of Jewelry. Ovadia Corp’s guide to Jewelry Display and Showcasing. We at Ovadia have created an assessment system to determine the effectiveness of the color that you are current using or are planning to use in the future for your jewelry displays and showcases. This simple categorization technique we have developed can assist it determining the optimal color scheme for your jewelry display. To illustrate how the categorization system works, we will be using jewelry displays from some of our presentation lines such as Reelwood and Diversity to provide examples. Some displays which will be shown are unattractive and were made specifically for this categorization course to show you what not to do. Ovadia would like to point out that when assessing the beauty of a jewelry display or showcase it is largely subjective, the opinions regarding aesthetic appeal and categorization is in part dependent upon personal taste. With that being said, Ovadia has 30 years in jewelry display and showcasing industry where we have relentlessly researched and studied how to make effective displays designed specifically to sell jewelry; we are the foremost experts in the jewelry presentation industry, there is no higher authority than us on the subject. 1. 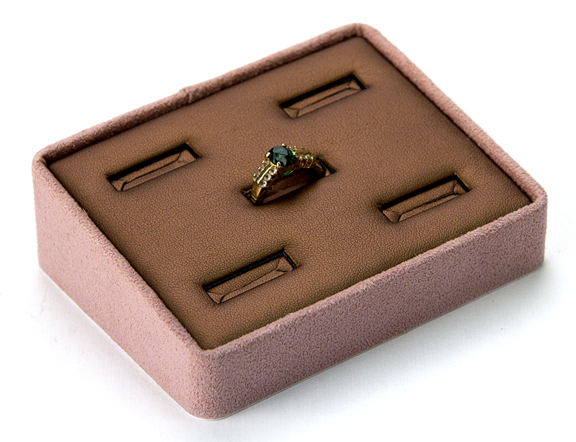 The worst case scenario (display category 1) is that your jewelry displays detract from your jewelry’s presentation, while simultaneously acting as a deterrent to customers approaching your display. 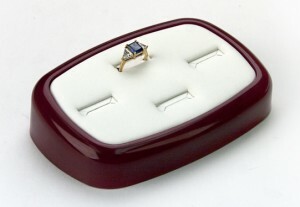 This is most common when your display consists of contrasting colors not only within the display itself, but a contrast in colors between the jewelry and the actual display. For example, suppose you have a display with a pink suede frame, a copper leather top pad, and you are displaying gold jewelry on it [picture of display below, ]. There is not only a stark contrast between the colors within the display, but the copper material detracts from the presentation of your gold jewelry. We at Ovadia believe in the philosophy that we would rather lose a sale and a customer then sell a category 1 display, as such a display reflects poorly on our company and will damage the sales of your jewelry. 2. Another possibility (display category 2) is that your jewelry display setup has a neutral look, one which is neither inherently appealing or unappealing, but takes away the beauty of your jewelry’s presentation. A neutral display often has one color tone to it. If there is only one color within the display, the possibility to repel a potential customer due to an internal contrast within the display is far less likely; a single colored display must either possess a very attractive color or very unattractive color to fall out a position of neutrality. Colors of a display we at Ovadia would define as a neutral standalone piece but as a detraction to your jewelry’s presentation would be a display consisting entirely of copper leather with gold or silver jewelry on it [picture below]. Unfortunately for the jewelry industry, some display companies actually sell displays that are covered entirely in copper leather as standard stock items. Such jewelry displays ultimately damage your jewelry’s overall presentation because of the clash in colors. Copper leather is detrimental to the look of all metallic jewelry (gold, silver, platinum, etc) when the jewelry is displayed directly on it. The only time we suggest using metallic leathers with metallic jewelry is strictly as an accent on your displays. 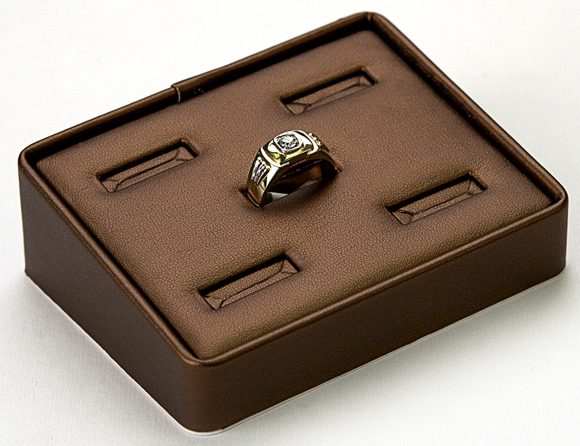 When used successfully, metallic accents on your displays can enhance the look of your jewelry presentation, but we do not recommend it being used as the surface which your jewelry is displayed on; with the one exception being pearl jewelry with a copper leather display surface. 3. A third possible display type (category 3) is one which looks nice as a standalone piece, fails at elevating your jewelry’s presentation by detracting from the overall look of your jewelry. Jewelry displays and showcases that are aesthetically pleasing as standalone often contain multiple colors. This is not to suggest single color displays and showcases are inherently unsuccessful at looking good on their own, but ultimately, using multiple colors within your displays is a far more likely to attract customers as a standalone from the fact that the eyes are simply not used to seeing single color tones at one time. It is rare to see a person dressed up with just one single color tone and jewelry displays and showcases should be viewed the same way. Ovadia is a firm believer that a single color tone jewelry display or showcase simply possesses less potential than a multi-colored showcase towards attracting customers to your jewelry presentation. Assuming you understand this principle and are looking for multiple color tones in your display, you still must take into account how the display will complement or detract from your jewelry. 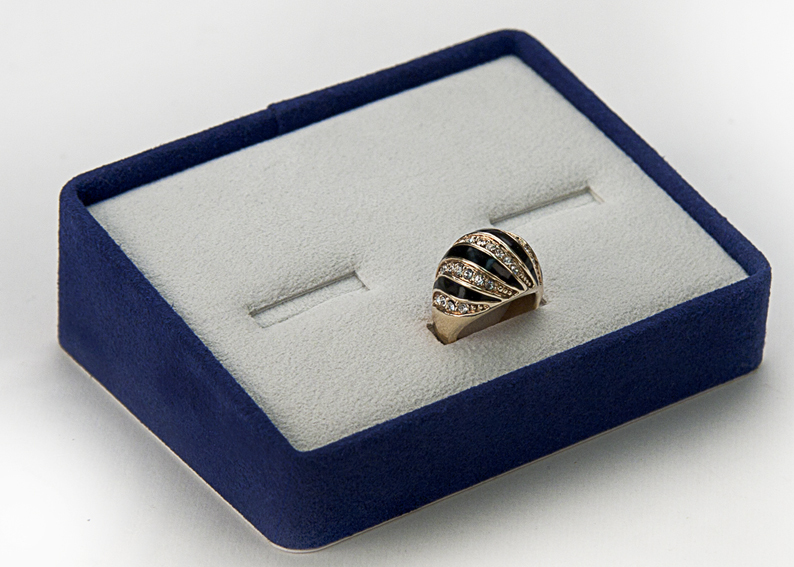 Too often, jewelers are concerned with how their displays look without the jewelry in it, when in fact the primary reason to purchase a display is to make jewelry more likely to be sold when it is showcased on the display. Some good examples of displays the exemplify the characteristic of looking good as a standalone piece while detracting from the look of the jewelry is a silver-tone top pad displaying gold jewelry with an accent that matches the silver-tone, but not the jewelry itself [see below]. 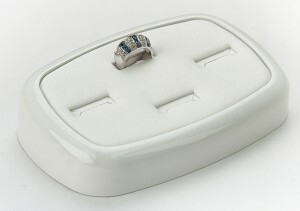 Another example would be of a similar vein, with an off-white top pad displaying silver jewelry with an accent that adds to the display as a standalone piece but detracts from the actual jewelry which is displayed . The jewelry which you put on your displays should not contrast too much, it is for this reason that we typically recommend gold and silver jewelry not be put on the same display at all because of the stark contrast. 4. The fourth category of jewelry displays which you might find is one that which has a poor presentation as a standalone piece but neither enhances or detracts from the appearance of the jewelry. 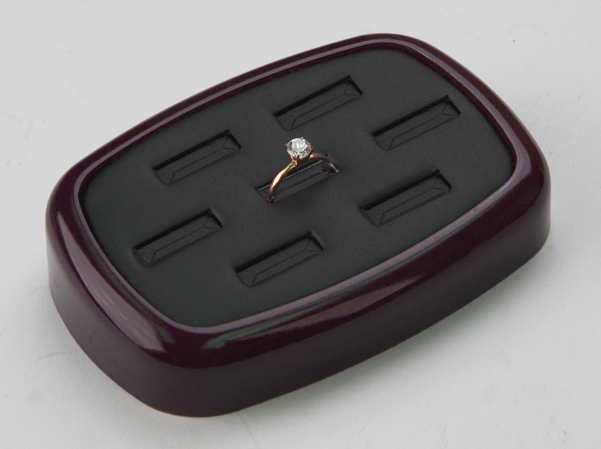 Such displays are often those with two tones which do not work well with each other at all, but the top pad of display has a relatively neutral color which neither compliments or detracts from the jewelry. An example of such a display would be a cherry wood frame, with a black top pad, and gold jewelry. A cherry wood display should typically have a light top pad to complement it, by using a black top pad, colors clash with each other creating an almost dreary standalone piece [see picture below]. 5. The next category (display category 5) of jewelry displays is perhaps the most common. It is the display which possesses a neutral look from a standalone perspective while providing no additional enhancement or detraction to the jewelry. A display or showcase that is completely white would be the best example of a display that fits within this category. While it is true that all white jewelry displays hold a plurality of the market relative to all other displays in the market, because it is so common it loses much of its novelty. 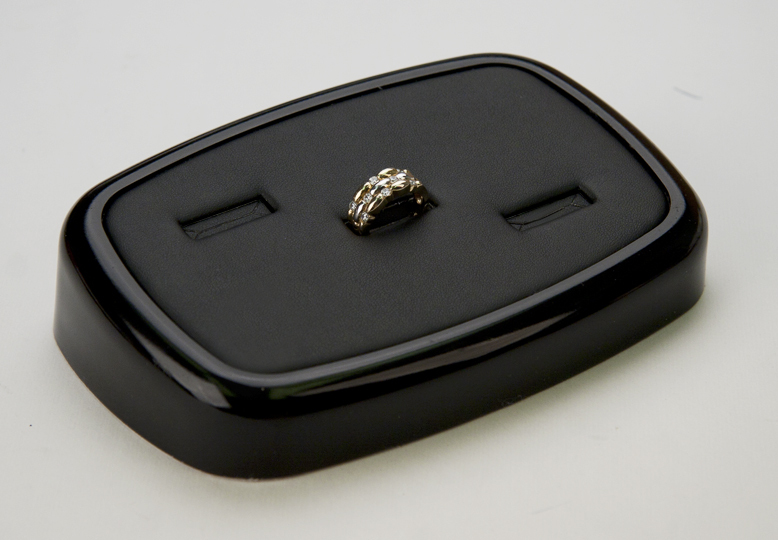 The fact is that white jewelry displays are a byproduct of low quality mass produced displays from China that can be sold to jewelers for a quick profit with no attention towards elevating the presentation level of the jewelry. It is true, a white on white displays may ultimately prove relatively effective at displaying your jewelry if you are using a variety of colored stones within a single setup and other displays prove insufficient at showcasing your particular jewelry. 6. The sixth categories of jewelry displays are those pieces which look good as a standalone piece but neither adds or detracts from the actual look of your jewelry. Such a display can prove effective at drawing customers to your jewelry and as a result can no doubt increase the sales of your jewelry versus a display which is not visually appealing. We feel that the display below [see picture below] using our cranberry Reelwood material and white Vienna leather falls into this display category, as it looks good as a standalone piece and will attract customers to your jewelry but will not necessarily enhance the overall look of the jewelry itself. Nevertheless, if your jewelry display or showcase falls into this category, then we at Ovadia believe it can be considered a successful display. 7. Another jewelry display category (7) are those displays which can repel customers as a standalone piece but add to the presentation of your jewelry. This type of display is very often one where possesses an accent that is far lighter than the plane which the jewelry rests upon. 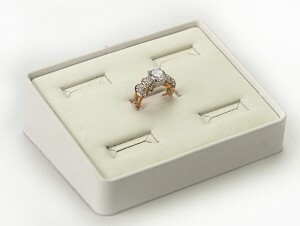 While we at Ovadia have had internal debate over whether such a display category even exists as so few displays on the market really exemplify the characteristics of this category, the tray below with a white framed display, with a off-white top pad, displaying gold jewelry [see below] we feel is close. 8. An eighth jewelry display category are those displays which have a neutral look that doesn’t necessarily attract customers relative to alternatives but elevates the appearance of your jewelry. Such displays are often those that were once real eye catchers and have been copied to death as a result so the presentation winds up being relatively neutral, but it still works towards successfully elevating the level of jewelry even if the display isn’t a real showstopper. Ovadia considers displays within this category to be successful, but not perfect, as the amount as the quantity of customers drawn to your jewelry presentation will still be impaired. One of the displays that we have seen that demonstrates such a showcase is our Amber Reelwood, with black Vienna leather as shown below [show picture]. 9. The ninth and final jewelry display category is one that both attracts customers from its aesthetic appearance and simultaneously elevates the appearance of the jewelry which is displayed on it. Only about 10% of all jewelry displays fall into this category, but displays that do will increase the sales of your jewelry. However, even within the 10% of displays which fall into category 9, there are varying degrees of effectiveness. It is ultimately up to you to determine what your optimal color scheme is to elevate the sales of your jewelry. One of the most effective display setups we have seen that we at Ovadia would classify as a category 9 display our black lacquer Reelwood material as an accent and black Vienna leather as the top pad color while displaying men’s titanium and silver jewelry [show picture]. The display was so effective because there was a subtle contrast between the black lacquer and black Vienna leather; if the display was made entirely out of black leather it would significantly devalue the presentation of the jewelry to a category 5. Below is a picture of a display with a white lacquer frame with a frost Vienna top pad, the the color contrast is subtle but the textural contrast is profound. The result is a display which provides a tremendous presentation for silver jewelry. A display made completely in white leather is has been overdone to death and has no contrast, and it is ultimately the contrast that will attract customers to your presentations, even if the contrasts are subtle. What category does your jewelry displays fall into? The most important thing you must remember about jewelry presentation is that your displays and showcases are competing with not only every other setup around it, but with every display and showcase your customers has seen over the course of his or her lifetime. If you are using a common or clichéd color scheme, people will know, either consciously or subconsciously. As a result, your presentation will be grouped within that same category as all the other setup your customer has seen within that same category and you end up with a display that is undistinguished. So put the time and effort into your displays and showcases if you really want your jewelry to sell the best it possibly can. We look forward to your comments and feedback on this subject. 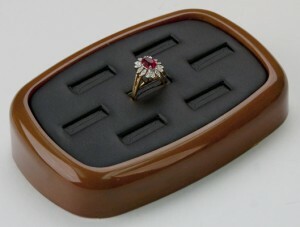 Phil Grossman on Should I Order Custom Jewelry Displays?